Initially we will conduct a study of the client's present organization and manpower requirements, and when appropriate, interview key members of the management team. We formulate a search strategy most likely to produce the best qualified candidates for the assignment. Our research into target industries draws on public information and the substantial resources we have developed over 25 years. Based on extensive consultation with industry executives and our own resources, we develop leads to prospective candidates who might otherwise be hard to identify and compile a broad list of prospects for the job within thirty days of initiation of the search. We then conduct personal interviews with those prospects that appear to be best suited for the position in order to evaluate their qualifications, motivation, personal compatibility with the client company and their level of interest in the opportunity. The few candidates who emerge from the interview process as being especially well suited for the position are then introduced to the client through detailed resumes and written information. These reports present factual information about the candidate.s current job, responsibilities, relevant experience, accomplishments and background. We also offer our subjective assessment of the individual.s qualifications for the specific position. Interviews are scheduled between client and candidates. If the search requirements so dictate, the client company's identity is not revealed to the candidate until this point in the process. 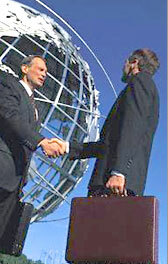 When the finalist candidate is identified and both parties express a strong interest in working together, we contact as references individuals who are qualified to comment in depth upon the candidate's abilities, integrity, technical competence, specific achievements and personal characteristics in order to verify impressions gained during the interview process. During the negotiation stage, our experience enables us to provide recommendations on the structure of a compensation package calculated to attract the finalist. By serving as intermediary, we can often anticipate and handle details which may have significant bearing on the final acceptance of the offer. Although the recruiting process is complete when an offer is accepted, we have found it helpful to stay in touch with the client and successful candidate during the transition period to provide assistance, if needed, as both adapt to the new working relationship.